time to really bring in the fans. Create an offer: Click the create an offer box. As a custom manufacturing company, this can be useful for generating leads. Here you can create an offer for online or in store offers. You can choose the expiration date and even include a promo code if you want to. An offer can be for a discount, free item, a free quote, or anything else you want. To create leads, require an email address if you are offering a free ebook or another offer. Create an event: Click the create an event box. Here you can create an event that is a one time event or reoccurring. You can create an event like a webinar, sale, or something else more creative to attract new or old customers. An example of a fun event to promote for a manufacturing business is a Ideas Webinar – offer a webinar giving potential clients ideas for their promotions. Add a shop button: If you sell products, you can showcase them on Facebook on a shop page with links for them to purchase online. Go to your Settings tab on the upper right of your Facebook page. Click edit page on the left. The add the shop tab. When you return to your Facebook page. You will see your shop tab. From here you can add products. Make a call to action button. People can book an appointment with you, book a service, learn more, make a purchase or even download an app if you have one. On the bottom right of your cover photo, click add a button. Here you can choose from these options. On our Facebook page, we placed the Use App button, so people can try our app out. Paid promotions: Facebook offers several paid promotion options to reach a larger audience. You can pay for likes or for people to visit your website. For promoting your Facebook page, you can click the Boost Page or Promote Page buttons on your Facebook page to do so. For promoting your website, click the Promote Website button. 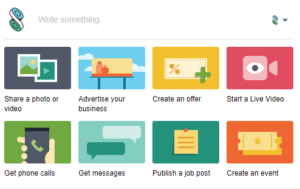 After you click either of these buttons, you will follow the sequence to create your Facebook ads. Use shopVOX’s CRM: Now that you are generating more leads through Facebook, it is important to make sure you input each lead into shopVOX. This is the key to keep track of each sales lead’s activity and progress. When you organize and track your leads, you will have better conversion rates. Hope these tips help you get started in your Facebook Marketing efforts. As a manufacturing business, you can get super creative with your marketing. Since you are a creative company, it’s important to stand out and share what you offer and these tips can help you do so. But, just as important as marketing is to keep track of every lead that comes in. As a shopVOX user, you have access to excellent sales lead and customer management tools. Use them. Your life will be easier!